Officers stand guard Sunday at the site of an attack outside a church in Surabaya, East Java, Indonesia. Suicide bombers targeted Sunday Mass congregations in three churches in the country's second-largest city, killing a number of people and wounding dozens in one of the worst attacks on the country's Christian minority, police said. SURABAYA, Indonesia — Coordinated suicide bombings carried out by members of the same family struck three churches in Indonesia’s second-largest city Sunday, police said, as the world’s most populous Muslim nation recoiled in horror at one of its worst attacks since the 2002 Bali bombings. The Islamic State group claimed responsibility for the attacks in a statement carried by its Amaq news agency. It didn’t mention anything about families or children taking part and said there were only three attackers. Jemaah Islamiyah, the network responsible for the Bali attacks, was obliterated by a sustained crackdown on militants by Indonesia’s counterterrorism police with U.S. and Australian support. A new threat has emerged in recent years, inspired by Islamic State attacks abroad. Experts on militant networks have warned for several years that the estimated 1,100 Indonesians who traveled to Syria to join the Islamic State group posed a threat if they returned home. Karnavian identified the father as Dita Futrianto and said he was head of the Surabaya cell of Jemaah Anshorut Daulah, an Indonesian militant network affiliated with the Islamic State that has been implicated in attacks in Indonesia in the past year. He identified the mother as Puji Kuswati. “At first officers blocked them in front of the churchyard, but the woman ignored them and forced her way inside. Suddenly, she hugged a civilian, then [the bomb] exploded,” said the witness, a security guard who identified himself as Antonius. The church attacks came days after police ended a hostage-taking by imprisoned Islamic militants at a detention center near Jakarta in which six officers and three inmates died. The Islamic State group claimed responsibility. 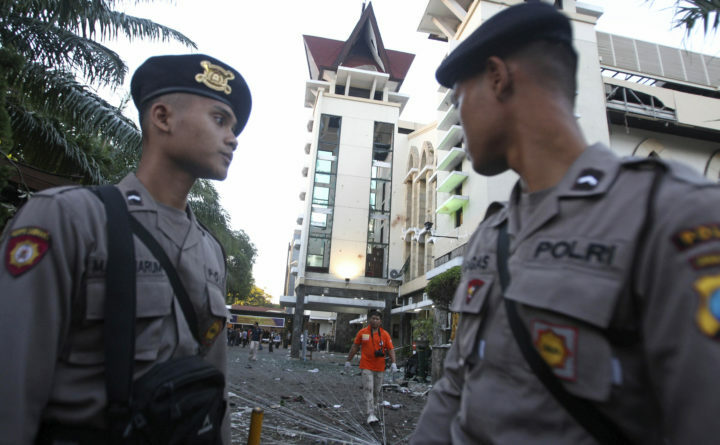 Despite Indonesia’s crackdown on militants since the Bali bombings, the country has faced a new threat in recent years as the rise of the Islamic State group in the Middle East invigorated local networks.